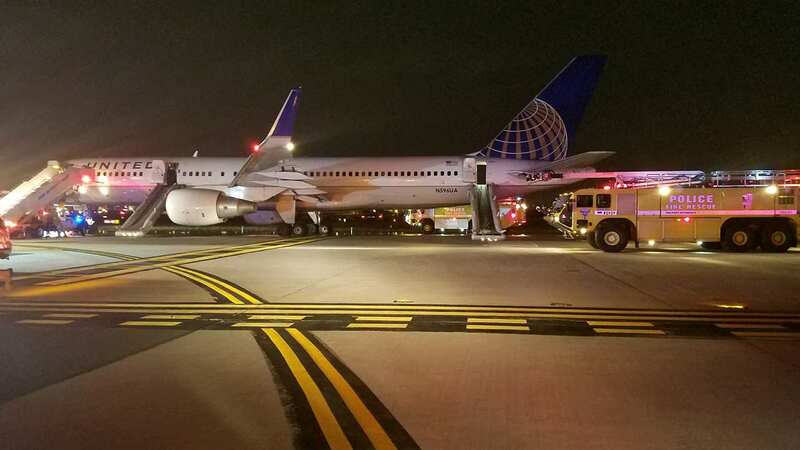 NEWARK, New Jersey -- New Jersey's Newark Airport has reopened after temporarily closing Tuesday night when a plane engine caught fire. United Airlines Flight 1579 from Newark to San Francisco was to depart at 9:22 p.m. on Tuesday. The plane, a Boeing 757, had 124 passengers and seven crew members aboard. While taxiing, officials say the engine caught fire and the chutes were deployed. Passengers of the plane were evacuated by using the slide. Airport officials say five people suffered minor injuries. Crews were able to extinguish the fire. The passengers were brought to Terminal C, Gate 71. "During taxiing of United flight 1579 from Newark to San Francisco, the tower notified the crew of what appeared to be flames from one of the engines. The crew immediately deployed the slides and evacuated the aircraft. At this time we have a report of only one minor injury. Customers are being transported back to the terminal. We are working to get our customers to San Francisco as soon as possible."